Yaws is not a widely known disease and does not occur in the USA but this does not make it insignificant to Americans. With global travel patterns yaws should be a concern for every traveler and in particular for children. It can be transmitted through direct skin contact and may lead to severe disfigurement and disability. The first signs on the skin may only become evident up to 4 weeks after contact, and yaws can last for years or even decades. Yaws is an infectious disease caused by a species of Treponema bacteria. The syphilis bacterium also belongs to this species. However, yaws and syphilis are two different diseases. Like syphilis, yaws can persist for years and even decades as a chronic infection. It mainly affects children and teens under the age of 15 years who reside in rural tropical parts of Africa, Southeast Asia and the Western Pacific islands. Although yaws is easily treated with antibiotics, it can be a very serious and debilitating disease. The infection targets the skin, bones and joints and over a long period of time it can lead to chronic disability and disfigurement. Yaws is the most common non-venereal treponemal infection. From the mid 1900s there have been global eradication programs and the World Health Organization (WHO) believes that the disease will be eradicated worldwide by 2020. Yaws is caused by the bacterium Treponema pallidum pertenue. It is a subspecies of the syphilis bacterium Treponema pallidum and a syphilis blood test may therefore be positive in a person with yaws. However, this does not mean that a person with yaws has syphilis. Yaws is not a sexually transmitted disease and it can also not be passed from mother to baby during childbirth as is the case with syphilis. There are four stages of disease. This is similar to syphilis. In this stage the first sore (mother yaw) develops at the point where the bacterium penetrates the skin. In this stage the spread of the bacteria results in many sores developing on the skin even if the mother yaw is still present. As the name suggests, there are usually no symptoms during this stage. However, lesions from previous stages can recur. In this stage the infection affects many sites in the body and the involvement of the soft tissue, bones and joints presents as deformities. The primary and secondary stages of yaws is also referred to as early yaws whereas the tertiary stage is known as late yaws. 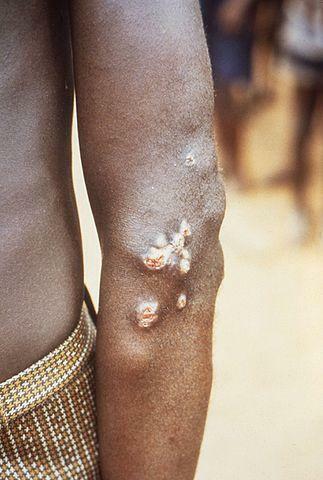 The first lesion known as mother yaws does not develop immediately after infection. The incubation period is around 2 to 4 weeks although it can be as long as 3 months. During this period there are no symptoms. 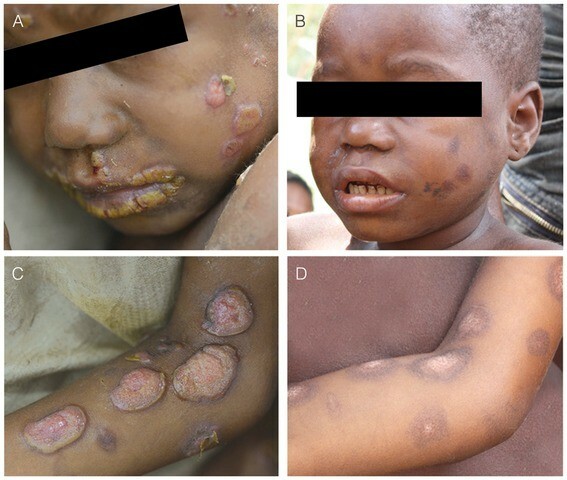 The main symptom of early yaws is the skin lesions. These sores are tan to red and can vary in appearance. It may look similar to a large wart (papilloma), skin lumps (nodules), flat slightly elevated lesions (papules) and sometimes there may be open sores (ulcers) that form on these lesions. Usually there is no pain with these symptoms although itching is typically present. There may be thickening of the skin on the palms and soles of the feet. The mother yaws varies from about 1 to centimeters in diameter while the other lesions that follow resemble the mother yaws but are usually much smaller.There may also be other signs in early yaws such as enlargement of lymph nodes at several sites in the body, fever and joint pain which are typical non-specific symptoms of a systemic infection. Sometimes there may be bone and joint lesions in the early stages although it is more prominent in late yaws. Late yaws develops after a latency period which can range from 5 to 15 years. There is widespread destruction of tissue from skin to bone. Nerve and eye damage may also be present. The skin lesions in the late stage develops as painless lumps under the skin (subcutaneous nodules). The lumps grow and eventually ulcerate. A secondary bacterial infection of these ulcers may arise and this complication speeds up the tissue destruction. The skeletal involvement occurs over a long period of time ranging anywhere from 5 to 20 years. It can affect bones anywhere in the body although the facial and limb bones tend to be affected the most. Along with the skin lesions and soft tissue destruction, the bone involvement can lead to extensive deformity and severe disability. Not all people who become infected with yaws will develop this late stage. It only affects about 20% of those infected who do receive treatment. Yaws can be easily treated with antibiotics. A single dose of penicillin is sufficient for early yaws while repeated antibiotic injections are needed for late yaws. People who are allergic to penicillin can still be effectively treated with other antibiotics like doxycycline, erythromycin or tetracycline. Azithromycin (oral) may also be effective (refer to before and after pictures below). Penicillin is still the drug of choice for yaws and as yet there is no known drug resistance. The prognosis for yaws is excellent if treated in the early stages. Yaws can be cured with antibiotics and the skin lesions will eventually heal. While late yaws can also be treated with antibiotics, the extensive skin, soft tissue and bone damage that leads to deformities and disability may be irreversible. Secondary bacterial infections that develop during relapses also need to be appropriately treated to limit the extent of the tissue damage. Death from yaws is very rare.